Cody my handsome little man! 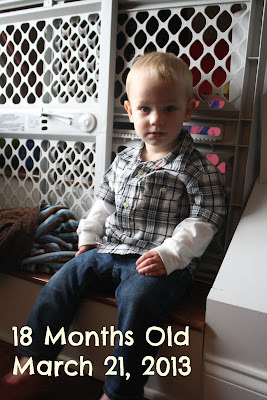 You are 18 months old today. This is a major accomplishment as it also means you can officially start going to nursery at church. Wahoo! Anyway, here's how you've grow. * At your check up today you got a clean bill of health as usual thank goodness! You are consistent on your growth line but I didn't catch all your measurements. But I do remember that you are in the 10th percentile for your weight, 25th percentile for your head, and 50th percentile for you height. * You still aren't talking much but here are some words that you use consistently and clearly: daddy (comes out daaaddeeee! ), mommy, drop, choo-choo, puppy, please (eeeaaase), boo boo, ouch (which it is absolutely adorable when you say that), poo poo (and you point at your bum), boobear (which we are pretty sure it means your blankey), NO!, and mine. * If you get injured, run into something, bump any body part, you immediately put your hand our your head and say, "ooooouuuuuch". It's hard to know where you actually got hurt because you only motion to your head. * You love to sit in the rocking chairs both the big one and the kiddie one. You've claimed the little one and get angry when Sarah sits in it. * You love to play with Mr. Potato Head, blocks, and cars. You got 2 trucks from your Auntie Cam at Christmas that you like to get out of the toy closet. * You have a feisty attitude. You yell and scream a lot and express tons of attitude on your face. You are definitely assertive in what you want which is anything that Sarah currently has. * You have a mischievous side which daddy says is just being a little brother. You will steal a toy from Sarah and then throw an evil grin across your face and go running. * You love to run and are trying to learn how to jump. It's so cute watching you try to get air under your feet. * Your favorite shows are Mickey Mouse Clubhouse and Little Einsteins. You are forced to watch Doc McStuffins and Sophia the First more than you probably would like. * Your favorite books right now are Brown Bear, Goodnight Moon, and The Ear Book. * You are so independent and stubborn. Sometimes it drives me nuts, but it's so you that at other times I can't help but laugh at you. * You're still a picky eater. The only vegetable I can get you to eat is canned carrots. You are hit and miss on fruits. For example, Monday I gave you blue berries and you spit them out, Tuesday you shoveled them in by the handfuls, and Wednesday you were insulted I even put them on your plate. I just can't figure you out. * You are a hitter. We're working on it. We've put you in timeout for it a few times and you cry like its the end of the world. * You are not overly snuggly but sometimes you do want to cuddle. It is always with your blanket that you fell in love with while you battled Rotavirus last month. You seemed to attach to your brown and blue stripped blanket. It's cute that you have a lovey but it's also a problem. After we were Rotavirus free it was time to wash EVERTHING. You flipped out that your blanket had to be washed. You cried so much that we eventually had to leave the house to distract you until the wash cycle was done. Then you cried while it was in the dryer. * There's never a dull moment with you around little guy. You are most definitely my handsome man, a daddy's boy, and Sarah's antagonistic shadow. We love you!